The Axom Gallery opens their fall schedule with paintings and prints by artist and printmaker Keith Howard, in his first large scale show in the Rochester area. I have been looking forward to seeing this new batch of paintings, to see how they have progressed over the past few years since the series has been underway. The show represents a kind of rebirth of photo-realism, but with a twist. The 20th Century photo-realists represented a kind of neutralized view of common everyday scenes – if you think of paintings by Richard Estes or Robert Bechtel, and now here in the 21st Century we’re getting a dramatized narrative, heavily influenced by Photoshop magic and declarative theatrical staging. Another twist to this show comes with the recognition of the collaboration between the artist, the model, and the painter – that is the equation being rendered here. 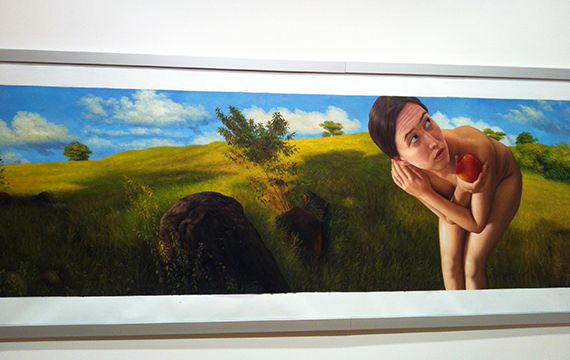 The artist has a dialog with the model, who has found her place in nature, and she responds to suggestions and the act of being photographed by creating a pose. Once a photo session is complete the artist assembles his composition with the aid of the digital tool box. When the composition is decided upon -the painting is completed on the other side of the globe, in China, by “master painter” Xiang Ming Lin. So the visitor to the show is forced to deal with contemporary notions of authorship. The visitor is also faced with a touchy subject – that of the male gaze, and the very act that is being pictured here of Eve offering an apple, or about to suffer the consequences of her actions, as in the image above (“Fleeing Eve”). So we get an emotion that emanates from the model, captured by camera and re-combined with many digital elements in a cinematic panorama which then gets transformed into paint by another hand that injects a whole other vocabulary of expression in the subtle details and delicate brush handling that completes the circle (.. and then the painting is hung in the gallery and we get to ponder it). It is no longer unusual to have artworks completed by an atelier, -this takes place because the artist is often under pressure to complete many more works than he or she has time to produce, and/or the artist employs a craftsman with a special skill or technique. Painters hire printmakers to run editions from plates that the’ve made, so Keith, who is a printmaker, turns the table on these expectations by hiring a painter to complete this work. A few blocks away from Axom Gallery, you can walk downstairs to The Oxford Gallery and check out the “Water Work”. We are talking about the creations from three artists who employ water based mediums to paint in. Roland Stevens has a conservative approach to his watercolors which meld an abstract structure to representations of Americana- sailboats, wrecked cars, duck hunters,- I am not sure what he feels most passionate about. 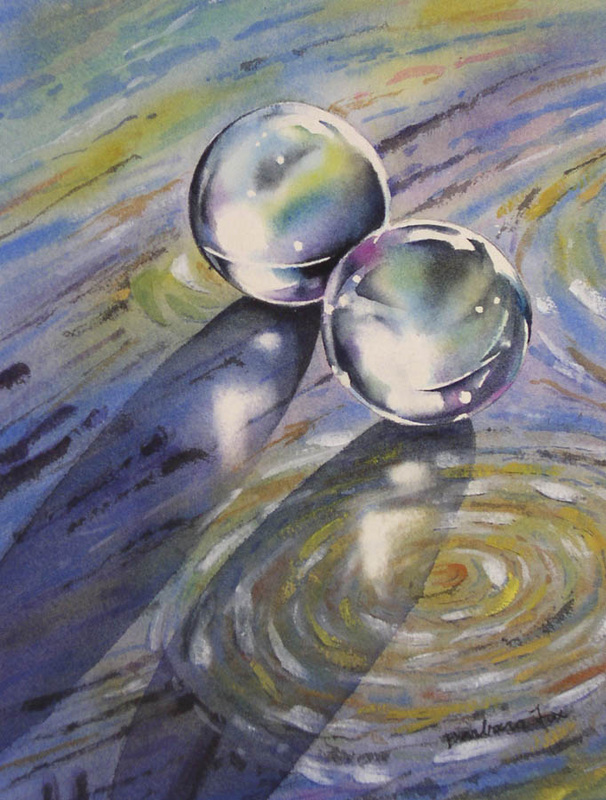 This is not the case with Barbara Fox, who fixes her attention on the way light passes through glass, or creates a quiet moment with a still life of poise and balance. Back to the gritty life on the street, Chris Baker digs heavy equipment, and his gouache paintings of box cars with graffiti are part of the urban history narrative playing out for all to see.